YANG Yan, YAO Lutian, WANG Yanfeng, WANG Xinxian, WANG Hanning, ZHANG Hangzhou, ZHOU Xin. 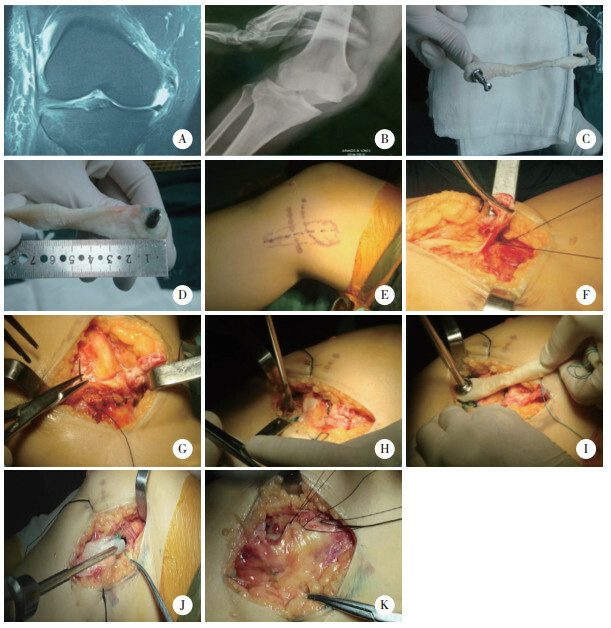 Curative Treatment of Grade Ⅲ Medial Collateral Ligament Injury Using Semitendinosus Tendon Autograft and Achilles Tendon Allograft[J]. Journal of China Medical University, 2018, 47(8): 724-729. Abstract: Objective To retrospectively analyze the clinical efficacy of treating gradeⅢ medial collateral ligament(MCL) injury using a semitendinosus tendon autograft and Achilles tendon allograft. Methods We treated 79 patients with grade Ⅲ MCL injury between July 2009 and January 2016. Of 40 patients included in this study, 21 received an Achilles tendon allograft (allogeneic Achilles tendon group) and 19 received a semitendinosus autograft taken from the healthy side(autogenous semitendinosus group). The range of motion (ROM), medial joint gap opening difference(radiographs during valgus stress test, side to side), International Knee Documentation Committee(IKDC) score, Lysholm score, preoperative findings in injured knees and postoperative complications were recorded and compared. Results All patients were followed up for an average of 21.3 (12-30) months postoperatively. The outcomes were significantly improved after surgery(P < 0.05). Complications, such as liquefaction seepage, were successfully treated. The visual analog scale(VAS) scores in the allogeneic Achilles tendon group were significantly better than in the autogenous semitendinosus group at 1 week postoperatively(P < 0.01). There was good continuity in the MCL on magnetic resonance imaging at 6 months postoperatively in both groups. The ROM, valgus medial opening difference, and Lysholm, IKDC, and VAS scores were also improved, but the differences between the two groups was not statistically significant (P > 0.05). Conclusion The curative effect of MCL reconstruction using allogeneic Achilles tendon and autogenous semitendinosus tendon was the same at midterm follow-up. 1) P < 0.05 vs allogeneic Achilles tendon group；2) P < 0.05 vs preoperative within group. NAQVI U, SHERMAN AL. Knee, ligament, collateral medial injury[EB/OL]. Treasure Island(FL): StatPearls Publishing, 2017[2017-05-22]. https://www.ncbi.nlm.nih.gov/books/NBK431095/.